New Zealand has the "enduring friendship and support of many partners around the world," President Obama says. Washington (CNN) -- The United States is sending a disaster assistance group that includes an urban search-and-rescue team to New Zealand to help recovery efforts after the Christchurch earthquake, President Barack Obama announced Tuesday. In a White House statement, Obama offered "our deepest condolences" to the people of New Zealand and the families and friends of earthquake victims. "To assist in the rescue and recovery efforts, we have agreed to deploy a U.S. Agency for International Development Disaster Assistance Response Team, including an Urban Search and Rescue Team, and we stand ready to provide more assistance as needed," the statement said. "As our New Zealand friends move forward, may they find some comfort and strength in knowing that they will have the enduring friendship and support of many partners around the world, including the United States," it concluded. Christchurch, one of New Zealand's largest cities, lay in ruins after the powerful earthquake Tuesday killed at least 65 people, toppled buildings and left scores trapped beneath chunks of concrete. 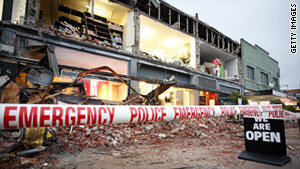 The 6.3-magnitude quake struck Christchurch during the lunchtime rush. "Significant numbers of people" were trapped inside two downtown buildings that "suffered major collapse," police said Wednesday.